A reliable source for Metal Catwalks information and a resource for accessing leading Metal Catwalks and suppliers. Metal catwalks are a type of flooring, used frequently with mezzanine structures. They provide safe and efficient access to areas between spaces that could not otherwise be traversed. Metal catwalks are popular in industries such as: warehousing, manufacturing, industrial processing and shipping and distribution. They are popular in these industries and others because they are reliable, lightweight, strong, versatile and relatively inexpensive. Metal Catwalks Metal catwalks are a type of flooring, used frequently with mezzanine structures. They provide safe and efficient access to areas between spaces that could not otherwise be traversed. Metal catwalks are most often found over machinery, in between buildings and in between workstations. They provide access to areas and equipment like: service areas, system monitoring devices, building mechanics, process machinery and conveyor systems. Metal Catwalk – Abtech, Inc. Most manufacturers offer both pre-assembled metal catwalks and custom metal catwalk fabrication. Depending your applications, you can purchase metal catwalks that are supported by the floor, supported by adjacent structures like racks, or hung from the ceiling. Typically, manufacturers make metal catwalks from strong expanded metal, such as expanded steel. Both grated surfaces and solid surfaces are common. They make the beams, columns and other elements used to support them from high tensile strength, structurally sound metals like thick gauge steel. If you require them, manufacturers can include components such as: stairways, ladders, railings or gates. They can also include flat bottoms, which are flooring pieces that you can lower at any time. 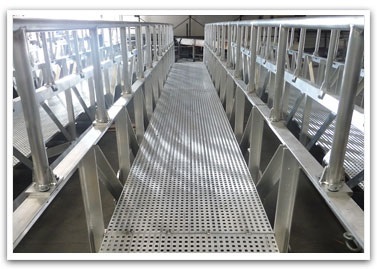 If you are in the market for a metal catwalk, you need to work with a reliable manufacturer, like those listed on this page. You should only purchase metal catwalks that have the OSHA stamp of approval. Also, make sure any manufacturer with whom you’re considering working is able to make catwalks that meet building code standards. Before searching out your manufacturer, though, you should ready yourself with a list of your specifications. Consider things like: your budget, standard requirements timeline, weight requirements, width requirements and surface texture/design requirements. For example, if you plan on wheeling anything over your catwalk, perhaps you should consider a solid surface, as the wheels will go over it more smoothly. Once you’re ready, equipped with your specifications list, check out those metal catwalk manufacturers listed on this page. All of those with whom we work are well-vetted, experienced and reliable.